Only practically focused certified training available in Ireland. This website does not place any cookies onto the computers of visitors to our site. However advertisers using our website may do so. We can not be responsible for these cookies. Any business sending or providing the facilities to send unsolicited email to us, will be billed for our business having to deal with them at commercial rates. Broadbandcareers is highly regarded as a provider of meaningful accredited training. We consider ourselves to be a "SOCIAL" Training provider, our focus being on the needs of the learner and businesses that could employ them and not the generation of profit at any cost. In recognition of this. We have been appointed by Emtelle the manufacturer of fiberflow air blown fibre FTTX Solutions, as their Exclusive training partner in Ireland. Being recognised as the leading hands on trainer in this field. We do not clutter minds with irrelevant complex theory. We follow a principle of providing only "contextual". Information, based around a qualifications specification, and the skills a business will expect our learners to have in order for them to do a specific job. In other words **we only teach the theory students need to do the job in the real world. ** At least 60 - 70% of our training is "practical hands on". By following this principle, we reduce learning time and ensure our training is relevant to how skills are deployed and used within businesses today. “Not Yesterday”. We combine the benefits of traditional trainer led learning, transportable distance learning, and Practical training. On a regular basis Broadbandcareers are consulted by businesses and organisations requiring support project managing fibre based Installation activities, and for advice on projects being tendered for, from upskilling staff, workflow management and equipment requirements etc. 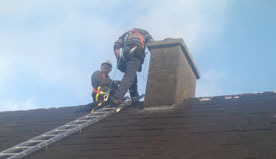 Technicians working for major employers in Ireland. Complete their daily work activities using the processes and procedures that we developed for the industry. Our trainers have over 30 years hands on experience within the telecommunications industry. Who are the courses for? Whether you are an individual looking to start a new career after redundancy, or are someone already working in these industries, We can meet your training needs. Allowing you to move forward in your chosen career.